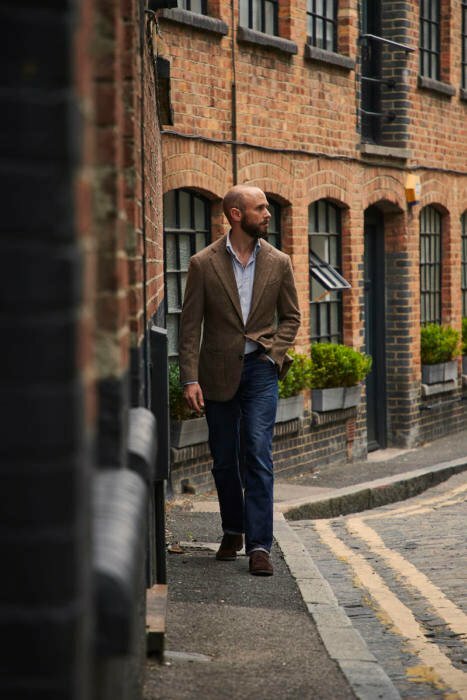 When Eduardo de Simone and I met at his factory last year, we spent a long time talking about the advantages and disadvantages of bespoke and made-to-measure (MTM) tailoring. As a result of them, Eduardo proposed an experiment. He offered to make me two jackets in the same cloth - one bespoke and one MTM - in order to physically compare the differences between them. Those two jackets are shown here, side by side. Before going on to discuss the differences, though, I feel I should repeat my standard warning about reading too much into photos. Static imagery can be misleading. You only have to see a model in a freshly pressed RTW suit to realise that. It looks sharp and clean, but the fit is still poor: just wait til he turns or raises his arms. This issue is more acute when comparing bespoke and MTM, given that so many of the advantages of bespoke (curved neck-hugging collar, small armhole with big sleeve) are not visible in photos. Nevertheless, imagery is useful to illustrate some points. So here it is. The first thing to note - and discount - is that there are style differences between the two jackets. The bespoke (on the left) has curved tops to its hip pockets and a curved 'barchetta' breast pocket. The MTM (on the right) does not. There's no reason you can't have those style points on an MTM jacket, it's just that Eduardo doesn't do it as standard. The bespoke also has hand-swelled edges, most visible around those hip pockets. This is something you can also get on MTM, though it's not common. It is more likely to get as standard on bespoke. Also, I feel a quick definition would be helpful. The major differences between these two jackets are that the bespoke was cut using a unique paper pattern, extensively refined during the fitting process, and had structural handwork such as a hand-padded chest, lapel and collar. The MTM, on the other hand, was made to a standard pattern with only small subsequent changes. It has none of the handwork. 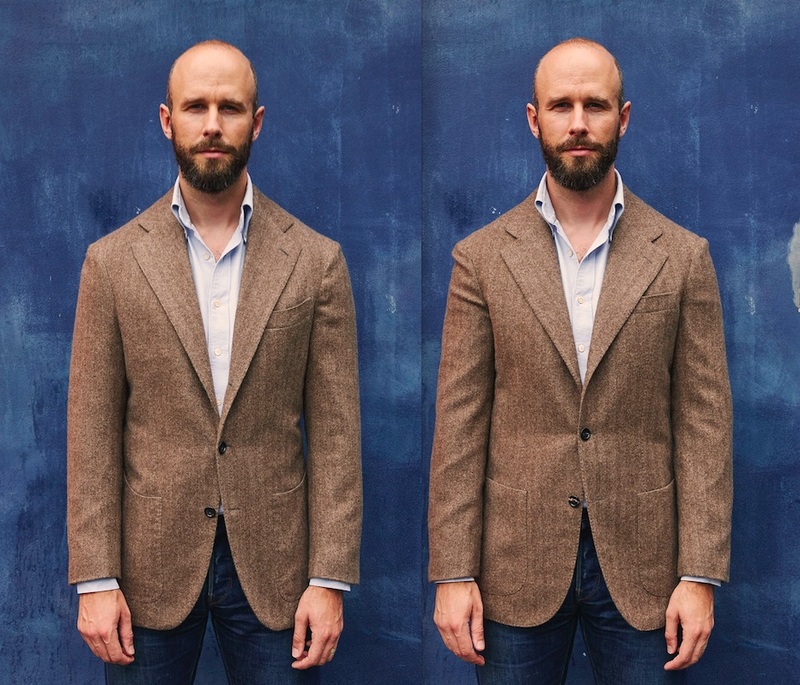 Those are the most important differences between bespoke and MTM, and they are what separate these two jackets. As mentioned, the bespoke jacket's small armhole and large sleeve affords much greater freedom of movement. And although you can't see the size of the armholes in these images, you can see the sleeves. The top of the sleeve is noticeably larger in the bespoke jacket (left) than in the MTM one (right). This is partly because a bespoke jacket can afford to have a larger sleeve here, as it makes less of a difference to the resulting armhole size. All that excess can just be worked in. The bespoke jacket is also evenly proportioned in its fullness around the sleevehead (where it joins the shoulder), while the MTM one is tight on the back side. However that point, and the fact the MTM sleeve is a little too tight for my arm along the whole length, is more down to lack of fittings and adjustments with MTM, rather than anything structural. Because the bespoke jacket has a hand-padded chest and lapel, it also has more shape in the top half - a curvature caused by that hand sewing creating a slightly domed effect. This can't really be seen in the photos, but you can see how long and smooth the roll of the lapel is on the bespoke jacket (above). The MTM version lies a little flatter, and the edge of the lapel angles into the waist button rather than running smoothly down to it. The collar on the jacket also hugs the neck a little better on the bespoke version, partly due to its shaping. However, I must say that it is not perfect on the bespoke one, and it does sometimes stand away a little. This perhaps illustrates another point about bespoke: it creates greater potential for a perfectly fitting jacket, but doesn't guarantee it. The fit is very dependent on the cutter - more so than with MTM, where the system tends to be set up to ensure consistency, and be less reliant on the fitter or salesman. This is a good bespoke jacket from Eduardo, but it's not the best I've had made. There is also a small (impossible to see) issue with the balance. 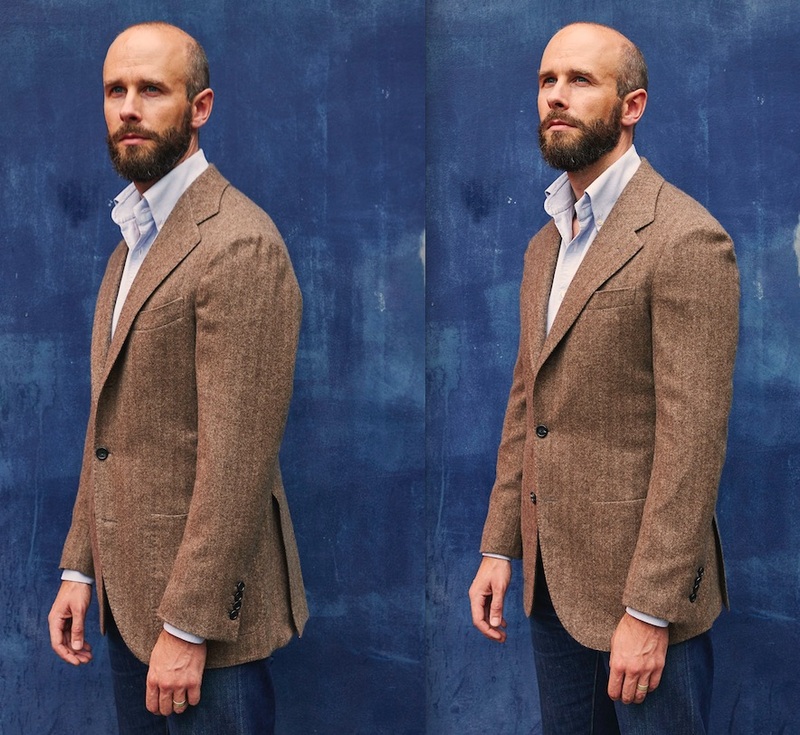 Which of course illustrates one more point about bespoke: that the second jacket will often be better than the first, and the greatest benefits of it come over time as a relationship and the pattern develops. Looking at the back of the jacket, the bespoke (left) is certainly cleaner than the MTM version (right). But even the MTM is pretty good. This is a very soft cloth (quite loosely woven cashmere) and it is always going to wrinkle, never hanging as smoothly as a tight worsted, for example. Most of the wrinkles on the MTM should be ignored, save for that tightness under the arms mentioned earlier. Equally, the pitch and position of the sleeves is identical, despite the appearance of more wrinkling on the bespoke version. Overall, I'd say this a good MTM product, which perhaps reflects Eduardo's focus on RTW and MTM in his factory. And it's an OK bespoke piece, with potential to improve in subsequent commissions. However, Eduardo is probably not the first person readers would think of for bespoke tailoring anyway. MTM is perhaps therefore the better call here - even though the bespoke is definitely a better product in terms of fit, make and finish. Eduardo's factory largely makes its MTM and RTW for other brands (which he would rather are not named) but he does also offer a little of his own tailoring under the brand Edesim. Bespoke tailoring is in a small section of the Naples factory, but is available to anyone that wants to travel there (it is also a little out of town in an industrial zone - not like other Neapolitan tailors). You can read about the overall outfit I am wearing - and why I think this is such a great jacket with jeans - in our previous post here. 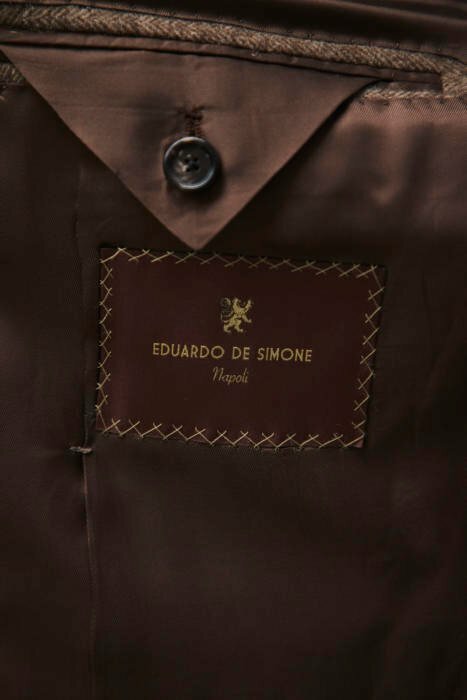 You can follow the discussion on Bespoke v Made-to-Measure: Eduardo de Simone jackets by entering your email address in the box below. You will then receive an email every time a new comment is added. These will also contain a link to a page where you can stop the alerts, and remove all of your related data from the site. What were the costs of both jackets please? Sorry, should have said – MTM is also available at the factory, 900 euros for a jacket without fabric. But you have to go to the factory. The vast majority of what Eduardo does is make for other brands. Articles like this are very informative and useful, Simon though I anticipate its of comments containing the qualification “But….”. This particular example creates a dilemma though given that many good quality RTW jackets are priced not far below the bespoke cost and then if you add the cost of getting a tailor to tweak the fit you really do have to consider whether to bear that little bit extra for the individual fit. Unless of course you go to higher end bespoke. For those not wanting to or cannot afford full bespoke this move toward better MTM is welcome, in my view and thank you for raising it as a topic. Hi Simon, comparison posts are always a good read. Would you consider some detailed comparisons on different shoemakers maybe? Some side by side shots on different approaches from bespoke makers to toe shapes, waist finishing etc. would be interesting. Given your comment on the light fabric and the wrinkling in the back – how are these lined, and would different lining alternatives have a notable impact here? I’ve now heard from more than one tailor that they would generally advise to have lining in the back for that very reason (i.e. less wrinkling). They were certainly capable to execute clean visible seams in an unlined jacket, so their recommendation was not for that often cited reason. Looking at e.g. Drake’s and their range of RTW jackets their is no lining whatsoever, but I wonder about the relative merits, especially in non-open weaves such as the current winter fabrics where the case for breathability should be minor. Thanks much! They are both lined, but the lining wouldn’t have made much difference. The cloth isn’t that light – just soft and open. When you’re having very lightweight summer jackets or suits made, this should be a consideration. Breathability vs clean fit. Crucially – where can we buy MTM? Just through visiting him at the factory. He does MTM through brands, but can’t talk about which ones those are. You’ve explained in one article what many struggle (including yourself) to explain over many years …. … the difference between bespoke and MTM. In fact this is such a good way of illustrating the difference that you should undertake another exercise like this . It’s interesting how the pictures tell one story but the writing another . I purposefully looked at the pictures and tried to guess (rightly, thanks to reading your articles over several years) which jacket was which . I think a cost comparison is needed now for these two jackets . P.S. you could take the exercise further by buying a RTW then having an exact MTM and bespoke made . It’s the ONLY way to really get across the differences . The answer to the question “why pay a lot more for bespoke when MTM is so good?” Goes a long way beyond how they appear to compare from the point of view of fit. Wear both regularly for 6 months and the answer will become obvious. The bespoke will fit, mould, loosen, and generally feel much nicer to wear. The MTM will start to look a bit tired. An interesting article, though I would saythat your physique being fairly “standard” may result in the two results being closer (in static photos at least) than if you deviated further from the average proportions. The benefit looks clear in the shoulders and upper back but would probably be questionable on a “value” basis. Whilst I’ve never compared MTM with bespoke from the same tailor/manufacturer there are worlds of difference in fit between the two for me, even when the MTM is more expensive than the bespoke but then I’ve reached my ideal weight but not my ideal height yet and MTM cannot deal with the waist to shoulder ratio in the same way as bepoke can so always ends up being too broad. Really interesting – I would have thought MTM could cope with anything as long as it’s two-dimensional. I guess maybe it also requires some 3D curve etc as well? You’re right, my experience is pretty narrow given body shape. The couple of experience I had with MTM (both in terms of actual items made and discussions about potential jackets) they pretty much universally stated they can only deal with a size or two’s difference (in RTW parlence) and not anything more than that. They did often say they could do post production alterations but that then defied the purpose of MTM to me. Now I know not all MTM are equal and so it may simply be that my choice of companies have less flexibility than others but its been my experience to date. Hitting upon my issue. I am 5’8″ 260lbs–thick from both lifting and eating–with fairly short arms/legs (29″ inseam) but a positive ape index due to being wide shouldered. I don’t fit into anything off the shelf and the MTM folks laugh. It would be nice to know what house styles would be most flattering to try without having to figure it out at a few grand a pop. “Permanently Stumpy” ? If you’re aiming to not emphasise the shoulders too much, and look longer and leaner, then generally a soft-shouldered style like Neapolitan or, for a smarter suit, drape cut in England, will be best. Style makes a bigger difference though: lapels that are moderate, not too wide; high trousers ideally to make the legs look longer; and as little interrupting the style as possible, so slit pockets, plain dark suits, no turn-ups/cuffs. Interesting! A photo with raised arms would have been good, to show the effect of higher armholes. I was thinking recently that a similar experiment could be very insightful: for example, to have a certain number of Neapolitan tailors make the same jacket (say, SB with patch pockets) from the same cloth (say, navy hopsack), for the same person (if you’re busy, I’m available!). Then the differences between house styles could be seen very clearly. I’ll be doing that with my Neapolitan jackets soon as part of the Finest Tailors series – not all in the same cloth, but that doesn’t make much difference. I was gonna say, wouldn’t some pictures of raised arms help show this? I have no experience with bespoke jackets, but I’m curious of the differences in 3D you mention. Is the difference as noticable in MTM with hand padded canvas like say Saman Amel neopolitan line? As I read this article, this MTM jacket doesn’t have that? Raised arms would help, yes. And different positions would help show the neck. But in the end I think you’re trying to show something in 2D photos which is really only going to come across fully in person? No of course, photos will never do any garment full justice. Ok, clear, thanks for clarifying. Excellent post, on a topic written much about on the internet, but never illustrated so well. Looking at the jackets, I think there are some bigger design (almost fit) issues that you didn’t mention. Perhaps these are a function of photos being inaccurate representations, but I think not. First, I think you look a little shorter and stockier in the MTM compared to the bespoke. Not hugely, but slightly. To me the higher buttoning point and lower gorge does this, though its effect on the lapel line. I also wonder if the width of the lapel is slightly wider in the MTM, but it may just be the effect of the above that I’m seeing. The pocket shapes also likely add to the stockier appearance of the MTM jacket. 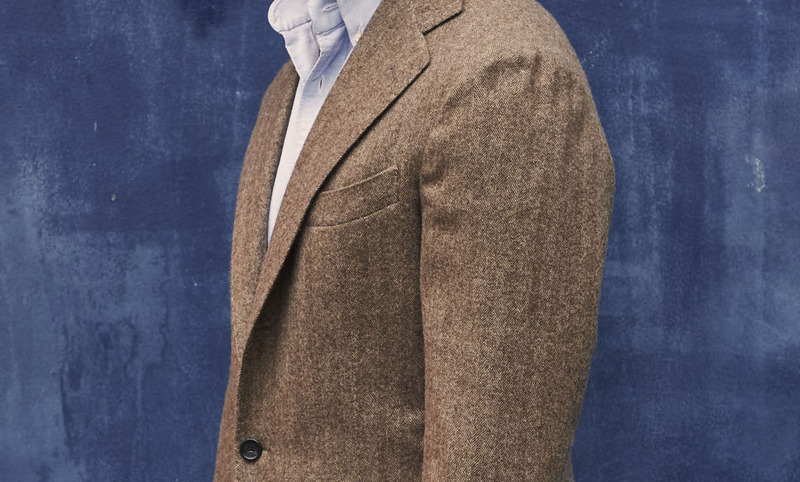 Second, and this is perhaps just the photos and chance, it appears to me that the bespoke jacket has cleaner sleeves, particularly near the sleeve head, and slightly shorter sleeves than the MTM, where less shirt cuff is showing. Overall, these two jackets are a great illustration of how subtle differences/improvements in bespoke have an effect. Good point on the buttoning point and gorge height, yes. The bespoke has cleaner sleeves, but as mentioned mostly from it being slim at the top and a little too slim through the rest of the arm as well. In your post on the bespoke jacket you mentioned that the jacket was rather short, is it shorter than Solito and Caliendo? When would you consider a jacket too short? It is a touch, yes. Not as short as Solito does by default, but around the same as Elia. Guidelines on length include being half your height from neck to foot, curling your fingers just underneath it, reaching the second joint of the thumb, and covering your seat. The latter is the most important in my book. Having it an inch longer or shorter is largely a question of style though, and I’m generally happy having more casual jackets (like this one) a little shorter than smart ones. Great article Simon, and Eduardo should be commended for his role in this project. Also, congrats on the diversity the list of most recent articles is showing – tailoring, workwear and maintenance. All helpful. My own sartorial experiments include bespoke from several makers and mtm from others. I ultimately settled on a traveling Neapolitan that also offers mtm. They were adamant at the first meeting that my frame would work perfectly for mtm jackets, but that trousers wouldn’t work. And that proved out in the finished product. I’ve probably commissioned a dozen jackets since then and the consistency is great, the ease/timeliness, as is the fit. I have asked a few times, what would be better if I went bespoke and the answer is always “nothing”. Which is great to hear and I treasure their honesty in not upselling me. I still order bespoke trousers with them and am taking delivery of a bespoke overcoat in a few weeks. Just mention all this as a point of reference for others. For me, the reduced time commitment and cost in mtm is well worth the types of fit tradeoffs that are mentioned above (and I can move button point, gorge height, and other details as needed in my situation). This is a great article for there certainly must be others like me in your readership that simply don’t have the time to build a wardrobe of bespoke, with each piece requiring multiple trips/fittings. Part of my enjoyment of menswear is that it isn’t as time consuming as it might otherwise be with bespoke. 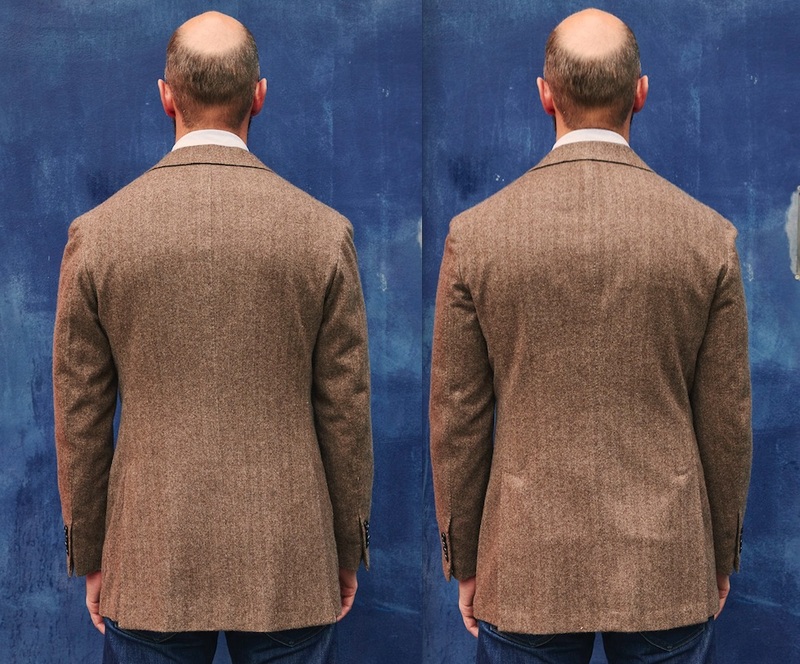 The back of the bespoke jacket is obviously cleaner; otherwise, for my money, the MTM actually looks a little better in the photographs (cleaner torso, less puckering around the sleevehead.) As you often point out, however, a photograph cannot convey what a garment actually feels like on one’s body or how well it moves WITH the body. Great and informative article – as I generally wonder is the difference between bespoke and MTM – and is it worth it to pony up the extra money for bespoke, if the MTM is just as comparable. Would be a fun series to do similar compare/contrasts with other pieces (shirts, trousers etc.,). I think this is a very informative article, thank you Simon! Sartoria Formosa is a brand that offers bespoke-level functional handwork – the sc I bought off the rack at NMWA frankly fits and feels a lot better than other custom options. I just ordered a MTM sc through Bryceland’s – made by Dalcuore to an exceptionally high standard as well – which I hope will exhibit the same benefits of MTM options that incorporate more handwork. This is an excellent choice for those of us who due to geography or costs cannot order bespoke regularly. Very good points, yes. Just like shoes, the two are merging together in some offerings. Why is it that a MTM jacket cannot provide the same small armhole and large sleeve head that bespoke does? Is it a limitation of machine sewing? Massimo Pasinato can do the hand-inserted sleeves as well in his MTM line. He would be another good one for an MTM to bespoke comparison. To me this article and pics do not make a convincing case for bespoke. Maybe comparing a good MtM with an ok bespoke maker have disturbed the results. What may be also interesting is having a jacket made in your favorite top quality rtw or mtm shop and getting your top tailor to do a similar cut (without producing the jacket or a jacket picture). It would capture the differences in making but also the real challenge in describing your tailor what you exactly want. You never really get what you wanted. I did try TF rtw, then tried to have something similar in Grande Mesure and a) the cut was not as nice b) the structure in the chest or other 3D volumes where not obvious at all in Grande Mesure. It took a third jacket to reach a cut that I prefer to the TF cut (mainly because I could ask for a few adjustments to the TF cut). I will continue to go bespoke because I am maniac about the cut and enjoy choosing fabrics out of thousands not dozens. Net net I think the advantages of bespoke are real but not as important as one reads, and only worth it to a few among us (put aside the irrational elements such as the nostalgy of traditions,…). So Simon you are saying you are a hipster! 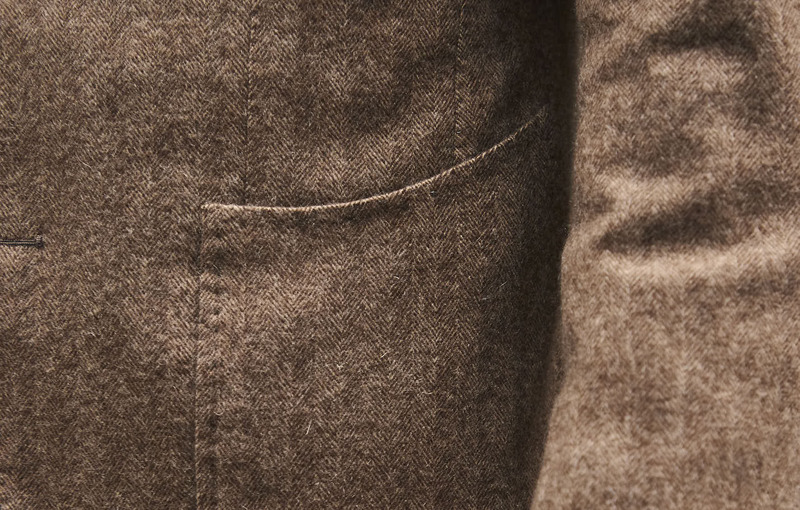 « hand-swelled edges« : are you referring to the 8mm band all around hip pockets, between edge and top stitch? If so, that is of interest as my tailor is struggling to make it swell. One of the most interesting posts ever. The comparison pictures not only show the superiority of bespoke but also of the barchetta pocket for a jacket like this. Could the mtm arms be let out enough to resemble the bespoke ones? It’s really amazing what a huge impact that barchetta pocket has on the overall style of the jacket. I find that a curved breast pocket makes it so much easier to wear a jacket in a casual way, i.e. with a crewneck sweater and sneakers. 1500€ doesn’t sound too bad, either. Fantastic post. It really highlights the difference between MTM and bespoke. One of the best articles on the definition of bespoke vs MTM I’ve read, excellent, almost forensic, detail. The descriptions re. extra work, particularly in the arm/shoulder are very informative. In looking at the images, accepting the caveats, the back and sleeves are clearly superior in the bespoke images, but, strangely, the MTM shows a cleaner front – the button position particularly helps emphasise the chest and waist – the bespoke comes in second in this regard (despite rolled lapel, handworked chest etc.)? Also is the balance issue that you mention the padding between l. vs r. shoulder (your left looks a little out)? I second future articles of a similar nature featuring other garments. As with Sam I’d love to see a comparison of suits (by SR) cut from the same cloth to gauge house and cutting style (same cloth for a uniformty of approach to drape and the ability to take on shaping, finishing etc.). The button position on the MTM is purely a standard style – it’s something you could easily have on bespoke. No, you can’t see the balance issue. You’d need to undo the jacket and then see it from the same angles to see that. On comparisons of other tailors, you’ve seen what we’ve done so far comparing Huntsman, A&S, Chittleborough, Richard Anderson etc? All on this page and expanding every couple of weeks. Excellent post. Really makes me appreciate how a curved breast pocket makes for a more prominent-looking chest. There’s no distinction in formality between a curved and straight breast pocket is there? Extremely interesting. Don`t think I`ve ever seen an article like this before. I understand, as a journalist myself, that it`s time consuming journalism. But it would be interesting to see this done with a full suit as well. Thanks for a great article (and web site). No worries, cheers Arnie. Nice to have a fellow hack involved! Simon…so much to comment on with this piece…I was going to say strictly from the photos, the only view where bespoke has the clean advantage, was the back of the jacket…and of course, you suggested it isn’t all about photos anyway. One of the key things missing from this discussion is basic construction…I would suggest that off the rack from a pinnacle maker – one that uses full lining with no fusion among other details – is much better than some of the lower end Made To Measure that features fusing (and yes, it does exist). Chain store clothiers offer this – and it isn’t inexpensive…. Re. suit comparisons: yes I’ve followed the suit comparison series, it’s very interesting and informative. I was simply laying out a ‘fantasy’ contrast and compare article that would show, within a similar fabric, the differing house styles (SR or Italian) that might match our personal ambitions for cut, style etc. Unrealistic perhaps, as there are probably more similarities than differences but it would be interesting nonetheless. In fairness (and perhaps also in reality) your series of articles are probably the closest to this aim anywhere. Thanks for this head to head! Would you be so kind as to include some pictures of the finishing on the jackets, please? Sometimes I have to shake my my head and laugh. You’ve brought me a long way Simon. Raised my consciousness (about menswear) so to speak. I know that sounds obsequious but I say it sincerely. I thank you. My bank account does not. As the armholes is the central part of a bespoke suit, It will be a good idea if you show it in your suits. The armholes are not the central part of a bespoke coat; the neck and shoulders are. SC- the bespoke version is so very much more satisfying, in my view. The effort you went to here is extraordinary. Thank you! They did make an attempt to re-fit the jacket at Pitti in the summer, but I haven’t heard anything since. Very informative, thanks Simon. Would love to know your opinion on Edward Sexton’s MTM vs Bespoke as it is more “easily accessible” for me – based in London. Thank you. I for one would love to see a “car review” type video on different bespoke/MTM tailors. How would you rate the quality compared to other tailors from Naples, like Solito, Caliendo, Panico, dalcuore etc. Thank you very much for your article. Would be interesting to hear your views on high-end RTW and MTM. I’m looking for a workhorse suit for work and I’m considering MTM, however, I’m slightly worried that in the end I won’t get what I want, after all it’s not bespoke so they’re not going to cut a pattern for me. At least with RTW you know from the start what you will be getting, but alas I do not like most of the styles offered by RTW brands. I have a couple of bespoke pieces so I know I won’t be getting that level with MTM, however, overall, do you think MTM is worth it it terms of fit vs RTW? Most of the time, MTM is an extension of RTW. So you try on a RTW suit, like it, and then get various aspects of style and fit changed. This is by far the safest way. MTM is very unpredictable otherwise. Whether it is worth it for fit over RTW, depends largely on your body shape, so whether the arms are always going to be too long/short for you, for example. You can alter the waist of RTW quite easily, so get the shoulders OK in what you buy, and then alter the waist to fit. But the other things are harder to change, like length and fit against the neck etc. Perhaps try RTW and see how hard it is to find these things to your satisfaction?